Winnipeg is the capital of the Canadian province of Manitoba. The main sectors of employment are manufacturing, trade, social assistance and education. Join the CSD certification in Winnipeg and stay ahead in the learning curve. The five-day CSD training in Winnipeg is meant for CSM credential holders in the IT sector. The coursework of this academy will be led by experienced tutors recognized by the Scrum Alliance. The CSD course in Winnipeg is divided into two parts. Basic concepts, frameworks, roles and ceremonies of Scrum are taught in a two-day course. The more advanced level subjects are taught in a three-day workshop using theory, practicals and live examples. CSM credential holders who work as developers, QA professionals, testers, software engineers, project/product managers etc. can join this course. If you do not possess these credentials then you can still take this course subject to a few conditions. Join the CSD certification in Winnipeg and master the theoretical and practical aspects of Scrum. After you successfully complete this workshop, your skills will be in high demand because of your proficiency in Agile. The CSD training in Winnipeg helps you master and demonstrate your skills in the principles of Scrum and Agile. Enrol in the Certified Scrum Developer training in Winnipeg and gain a two-year membership in the Scrum Alliance network. This workshop is being arranged by KnowledgeHut which is a global partner of Scrum Alliance, USA. Considering the cost-effective fee and high quality of training, KnowledgeHut makes for a wise choice. 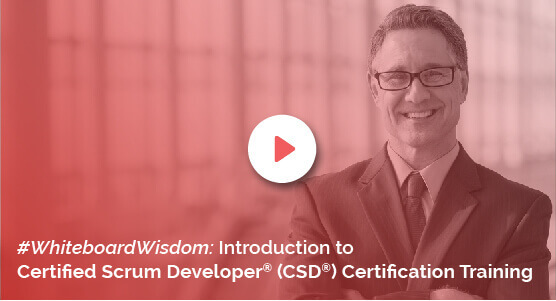 Get 100-day free access to the online coursework after signing up in the Certified Scrum Developer certification in Winnipeg.